Candidate A once held the position of Secretary of Administration and Finance, nicknamed the deputy governor of the Commonwealth. He was also an executive in a health care company, a sector that is vital to everyone in the state and a driver of the economy. He is a really good guy. Candidate B, well, he fits the same description. 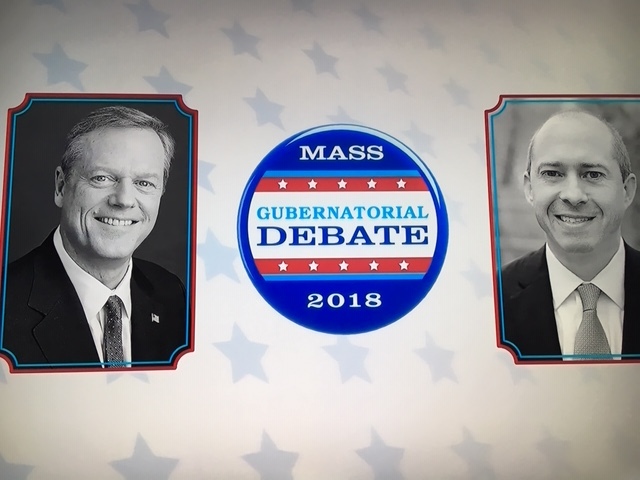 They’re both running for governor, Republican Charlie Baker for a second term and Democrat Jay Gonzalez to unseat him. There is substantial agreement between them on most issues: reproductive choice, gun control, green energy, funding pre-school, on and on. The major differences are style and the credibility of their plans. Gonzalez is a big picture guy, visionary, who criticizes virtually every Baker initiative as “small ball.” He charges that Baker is not doing enough and represents little more than incremental change and status quo. Gonzalez claims he offers “bold leadership.” Baker chides Gonzalez for offering over-reaching campaign promises, “overselling what’s possible.” I think they’re both right. Gonzalez does have a big vision, but his plans for funding it are rooted in shifting sand. He wants to raise $3 billion, $1 billion from taxing large college and university endowments (which generally go to fund financial aid for students) and $2 billion from a tax on million-dollar incomes, which has public support but trouble passing constitutional muster. The price tag for all the programs in Gonzalez’ “plan” far exceeds the money he’d get even if he could get the taxes passed within two or three years. Baker’s predecessor, Deval Patrick, was a charismatic, visionary leader who often fell down on day-to-day management and agency oversight. By contrast, Baker’s goals upon taking office lacked rhetorical flourish: rebuilding relationships with the Commonwealth’s cities and towns; working on what he calls “blocking and tackling,” that is, wrestling with priority management problems; and taking a collaborative approach with leaders across New England and in Washington. As I wrote more than a year ago, Baker’s approach has involved some of the Commonwealth’s most knotty problems: the Department of Children and Families (DCF), the Health Connector, the T, and the Registry of Motor Vehicles. All got some fixing, but more must be done. The T has become a more effective enterprise, but, because parts of the system are a century old, triage has been necessary to stop the bleeding and prepare to reduce the huge backlog of deferred maintenance. (Long-term, the T will need billions of dollars in investments in its core operating systems.) In all these agencies, Baker says, his administration has taken a “no drama approach” to carrying on their work. Gonzalez is relentless in his attack on Baker’s approach, repeating “not enough,” “should have stepped in earlier,” “totally unacceptable,” and “need to aim high.” Where he really (and legitimately) makes Baker squirm is on Baker’s inevitable commitment to support the Republican ticket, which includes Elizabeth Warren opponent state senator Geoff Diehl, who ran Donald Trump’s Massachusetts campaign and zealously supports the President. Baker clearly does not, but running as a Republican in Massachusetts presents an unenviable dilemma. For four years, Baker has worked to get things done on a bipartisan basis, but on election day he tilts toward his party base, and Gonzalez has made political hay of that. It is cringe-worthy to think Baker wants to send someone to the Senate who would support Trump and all the things that Baker himself opposes. Clearly, this is an uphill battle for Gonzalez. Recent polls put Baker at a two-to-one advantage. Even a majority of Democrats say Baker is doing an adequate job. Gonzalez is certain that “adequate” isn’t enough, but he has yet to make the case that implementing his own vision is either realistic or affordable. Barring some late October “surprise,” it’s hard to see how Gonzalez pulls this off or, for that matter, why we should root for his success. This entry was posted in Politics, Uncategorized and tagged Democrat Jay Gonzalez, Governor Charlie Baker, MA gubernatorial race, managing the T, proclaiming a vision for MA, Senator Elizabeth Warren, State Senator Geoff Diehl, the RMV and DCF. Bookmark the permalink. The corrupt culture of the state police is reinforced by the corrupt culture of the environmental police headed by Baker’s former driver. The environmental police had continuing problems but Baker stood by his (corrupt) man. Baker plays being the good guy realist. His passiveness on corruption challenges his claim to that label. His realism leads to his support for a senator for Trump; this realism is not consistent with being a good guy. Please note: environmental police colonel was fired yesterday.